I like try new web service especially for web 2.0, but many sites offer membership that mean you need use ID and password to sign in. I have big problem to remember these site's password, too many passwords make me mess and confusing, I do not know which is which when I need log on. Now, Spyshackers can help you organize your password. Spyshackers is a website built to safely manage your favorite websites and passwords from any computer. It is very simple to create your account, click "Sidebar" on the top line of main page, click on "Add Sidebar Panel". A bookmark will be created. Now click "Bookmarks" in the browser and follow the "Spyshakers" bookmark that has just been added. Sidebar will start automatically. Then, you can create your free account. Next, you can add website, user name, and password. So every time when you want log on your site, just click "Spyshackers" on bookmark of Firefox, log in your Spyshackers account, it shows you a list of your favorite sites, use mouse hover to list that will show your ID and password. You click site's link, and move your mouse to "UN" and "PW", it shows your ID and password for that site. You can copy or drag it to log in bar. It is very easy. So you do not need worry about spyware, keylogger. 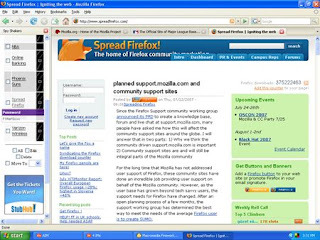 You can access your favorite sites anywhere, from any computer.